Han Alister was once a street thief and gang leader, nicknamed Cuffs for the magical silver cuffs he's worn for as long as he can remember. Now that he's reformed, he can't seem to escape from his past, and he spends much of his time hunting in the mountains with his clan friends. When he and his friend Fire Dancer meet a group of young wizards, Han comes into possession of a magical amulet linked to the legendary Demon King, not knowing that it will bring danger to him and his family. Meanwhile, Princess Raisa is soon to turn 16 and be named heir to her mother's throne. She becomes aware of intrigues that surround the queen, who seems to be strongly influenced by their country's High Wizard. Soon they will discover that nothing is as it seems. Blurb: Full of intrigue and mystery, The Demon King is a great read for someone wanting to get lost in a fantasy world. Review: This book came SOOOOOOO highly recommended. People couldn't stop raving about it. I was told it was the "epitome of high fantasy." Apparently I don't know what high fantasy is. I thought that would involve action and adventure. I really wish people hadn't hyped this so much for me, because as a result I thought that This book was SOOOOOOOOOOOOOOOOOOOOOOOOOOOOOOOOOO boring. After 100 pages I thought, surely NOW the adventure will begin. But no. Certainly by 200 pages? No. I DESPERATELY hoped it would begin around page 300. But again, nothing. Eventually I realized that there wasn't going to be any grand adventure. It was just going to be a bunch of people talking and thinking and not doing much else. Granted, there was some action in the last 50 pages, and I have hopes (and the testimonies of people who have read it) that the second book will be more the action that I expected in this one. If this book hadn't been so hyped, I think I would have really liked it. But as it was, this was NOT what I was expecting at all, and I therefore didn't like it. Still gave it three flowers because the story was good (if boring), writing was great, and [most] characters were well developed. Awww, sad face. I'm sorry you didn't like it. This is one of my favorite series and Chima's writing induced some serious writer envy in me. Have you tried The Warrior Heir? I haven't read it yet but it's more grounded in our reality (read: not high fantasy). You might like it better. 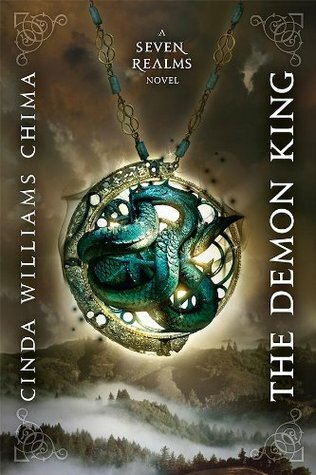 For what it's worth (very little), I was "meh" towards The Demon King, but really enjoyed (though didn't looooooove) the next one. I haven't read this book, and am a little nervous to because of all the hype. I'm sorry you didn't like it as much. Great review, though! Yeah, high fantasy is usually pretty slow. It involves a lot of back story and other elements to get it going. I listened to this one on audio during a couple trips to Idaho and book. The audio was great. And, you'll find with the rest of the series that you appreciate the story building that she did in the first book. (Or maybe not, I just know that I did).